Humax has finally announced a launch date and price for its eagerly awaited Freesat+ PVR. The Freesat+ box will be available in 'mid-November' for a price of £299, finally bringing Sky+ like functionality to Freesat subscribers. Of course you'd never guess that from the Freesat+ name. 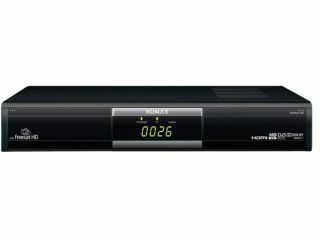 The twin-tuner box (allowing two channels to be recorded at any time) comes with a 320GB HDD allowing up to 80 hours of HD programming or 200 hours of standard television. As you would expect, Freesat+ allows pausing and rewinding of live television, series recording and split programme recording. "The launch of Freesat+ with the FOXSAT-HDR is an exciting milestone for us, said Freesat's MD Emma Scott. "We're giving viewers the freedom to enjoy all their favourite standard definition shows, as well as the likes of Strictly Come Dancing, UEFA Champions League, England home games and blockbuster movies in HD whenever and however they want – for no subscription and no extra monthly bills." It's been a long wait for Freesat customers – but they now finally have a set top box that isn't going to make them feel quite so inferior to Sky+HD customers.